Synopsis: When a mysterious woman seduces Dom into the world of terrorism and a betrayal of those closest to him, the crew face trails that will test them as never before. Eight films in sixteen years, and somehow the Fast & Furious franchise is still going on and has become stronger with every entry. The film franchise that started as a street-racing film have become heist films that focus on a family of misfits we all love. It’s fair to say the franchise really found its stride with Fast Five, becoming better as the franchise went on. So it’s a bit of a bummer to say that The Fate of the Furious is a step down for the franchise that has broken all the rules of gravity and has challenged us to suspense our disbelief to new levels. Not only that, this is the first film without Paul Walker after his tragic sudden passing during projection on Furious 7. 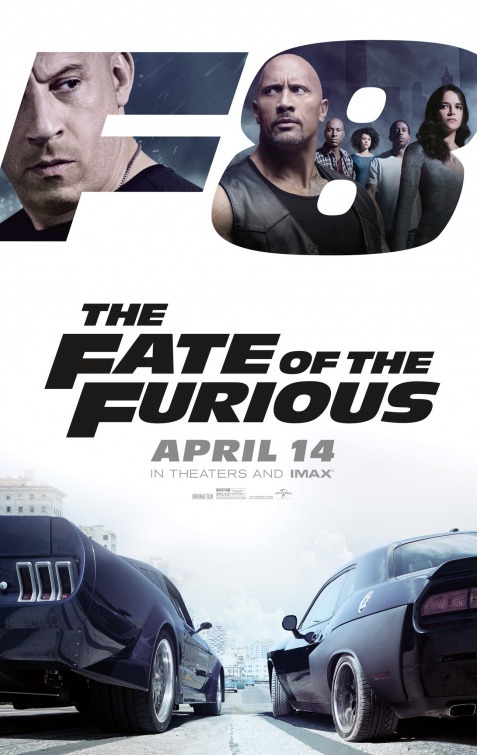 The Fate of the Furious opens in Cuba, where Dom (Vin Diesel) and Letty (Michelle Rodriguez) are on their honeymoon, and in true Fast & Furious action, Dom gets himself into a race. Afterwards, Dom encounters a mysterious woman who knows who he is and all about the crew, Cipher (Charlize Theron). She tells Dom that he’s going to work for her, which of course Dom scoffs at, but shows him something that shakes Dom. 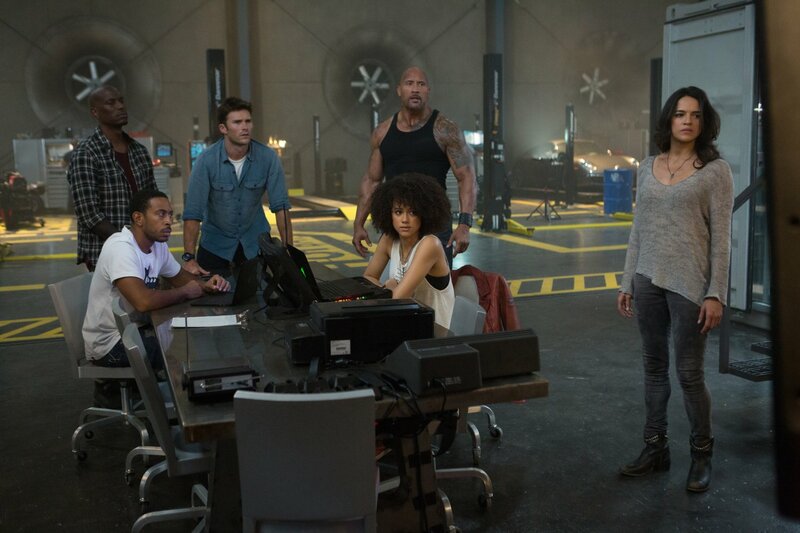 We cut to Hobbs (Dwayne Johnson) who is recruited to get a team together to reacquire a dangerous device, which sets up Hobbs to recruit our team we all know; Roman (Tyrese Gibson), Tej (Ludacris), Ramsay (Nathalie Emmanuel) – sans Brian and Mia. It’s there that Dom betrays the group and gets Hobbs captured and sent to a super max prison where Deckard Shaw (Jason Statham) is being held. What follows is the crew trying to figure out why Dom has betrayed them and is working with Cipher, and if Dom is even worth saving. Of course, one of the biggest questions everyone will have is why has Dom betrayed his family, and thankfully long-time franchise writer Chris Morgan (since Tokyo Drift) doesn’t leave us wondering for too long. The reasoning does make sense too, it’s not some lackluster idea, especially if you’re a fan of the franchise. However, it does make you question what will happen now as the franchise moves forward. The other question is how is the film without Paul Walker’s Brian, and the answer is simple: it’s different. However, it doesn’t rely itself on always bringing up Brian either. He is brought up at one point that makes sense, but after that it’s all about the crew, as it should be. When it comes to the cast, they all have played the characters enough times we know what to expect. Rodriguez’s Letty is the only one that hasn’t given up faith in Dom; Gibson’s Roman is the comic relief as always, although it felt his humor was heighten his time around; Ludacris’ Tej and Emmanuel’s Ramsay bring the technical aspect to everything; and Dwayne Johnson’s Hobbs is still an unstoppable, quick-witted, and cheesy line delivering machine who goes insult-to-insult with Statham’s Shaw. Speaking of Johnson and Statham, these two should are incredible together. It would be disappointing if they don’t do more movies together. Kurt Russell also pops in as Mr. Nobody again playing it cool like only he knows, and brings in Scott Eastwood’s character who, isn’t really all the great and sticks out like a sore thumb. I don’t know if it’s because I’ve never Eastwood in anything, or if the character just wasn’t right for him, but I wasn’t digging his character. When it comes to Charlize Theron’s Cipher – the first female villain of the series – her character is different than you would think. She has her own way at looking at the world, and in true Fast & Furious fashion, her character has a connection to the past films which is why she goes after Dom. I wouldn’t rank her character up there with Owen or Deckard Shaw, but what she’s able to do with a computer is rather frightening. Going off that, this leads to one of the biggest, and franchise regular absurdity set-pieces, the “zombie” car scene in New York. The scene involves Cipher hacking every car with a computer in New York City so Dom can complete one of her missions. It’s a rather impressive scene, but goes with one of my major gripes with the film: the heavy use of CGI. The scene would have probably been very dangerous to have that many cars do what they do, although they did do some of it since they released a behind-the-scenes online. But, it was the obvious use of CGI which really takes you out of the scene, and it wasn’t the only scene to do it either. I’m not opposed to the use of CGI, and it’s not like the franchise hasn’t used it before, but at least the other films hid it a little better than Fate of the Furious. Not only that, it’s not even the best scene in the film. You can make the argument that the prison riot with Hobbs and Shaw is, as they fight their way out and show off Hobbs being, well, Hobbs. All in all, The Fate of the Furious isn’t as great as the last three films. I don’t think the franchise has run out of fumes, I think it is trying to readjust after the death of Paul Walker, and trying to find its footing again. We can’t blame the franchise either, I’m pretty sure no one thought the Fast & Furious franchise would make it to eight films, but it has. The characters that we love are there, and the action is just as crazy as you would think with cheesy one-liners to back it up. Is the franchise going to lap out after this? No, probably not. This entry was posted in Movie Review, Movies, Review and tagged 2017, April, Charlize Theron, Chis Morgan, Chris "Ludacris" Bridges, Cipher, Deckard Shaw, Dom Toretto, Dwayne Johnson, Elsa Pataky, F. Gary Gray, Fast & Furious, Fast 8, Helen Mirren, Hobbs, Jason Statham, Kristofer Hivju, Kurt Russell, Letty, Michelle Rodriguez, Movie Review, Movies, Nathalie Emmanuel, Ramsay, Reviews, Roman, Scott Eastwood, Tej, The Fate of the Furious, Tyrese Gibson, Vin Diesel, Zombie Car. Bookmark the permalink.